Another example of Shearwater’s innovation is category is the removal of sediment contaminant from fresh water storage reservoirs, using techniques and technology unique to the European market. This type of work emphasises an ambitious mindset of continuously exploring the boundaries of what can safely be achieved in the underwater working environment, an attitude that has allowed Shearwater to solve many highly complex engineering conundrums on behalf of its clients. 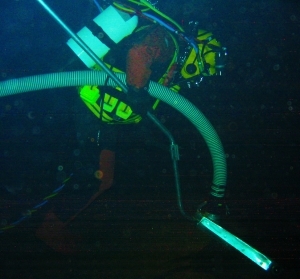 Using a system called “reverse hazmat diving” which completely isolates the diver from the surrounding environment; divers have been able to remove sediment from, inspect and repair all types of reservoirs with absolutely no risk of contamination, sediment disturbance, or the need to drain down the systems being cleaned.